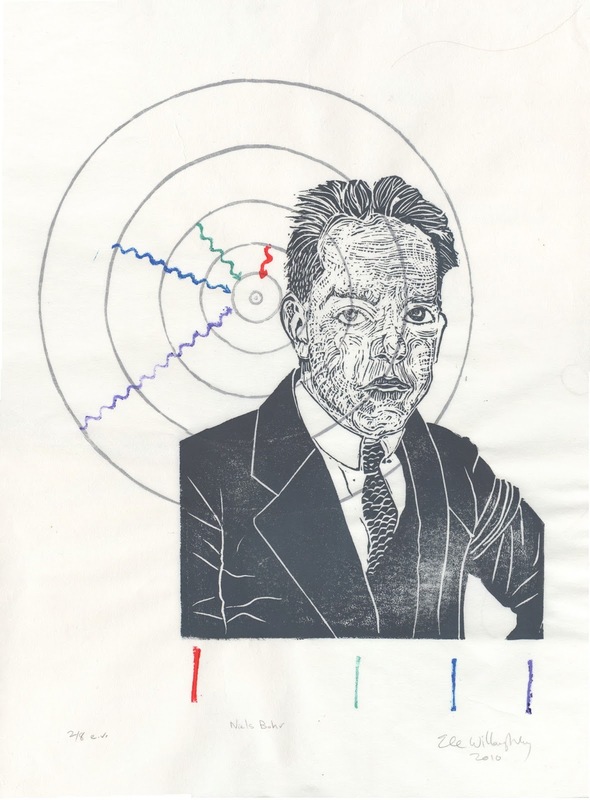 I've just printed a new edition of my portrait of quantum physicist Niels Bohr (1885-1962). One of his most famous contributions to quantum mechanics was the Bohr-Rutherford model of the atom. Bohr is shown next to the Bohr model of the Hydrogen atom (all the concentric circles are actually at the appropriate spacing, proportional to the n squared, which probably reflects on my sanity in some way). 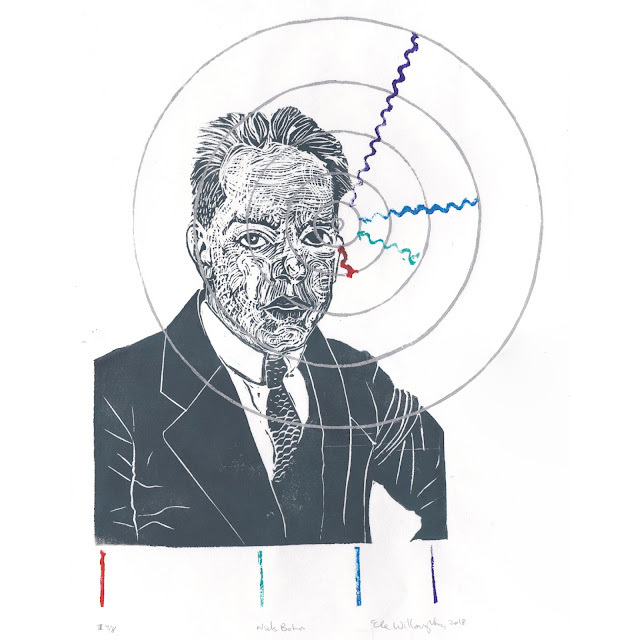 Bohr proposed that the orbits of electrons were somewhat like planetary orbits (though circular, and at specific quantized distances). To explain how orbitting charged electrons didn't lose energy and annihilate spectacularly with the so-called "spiral death" (physicists are big on melodrama, I'm telling you), he stipulated that perhaps they simply weren't allowed anywhere but the specific orbits. They could lower their energy state if excited by falling to a lower orbit, giving off a specific photon of a specific colour related to the difference between energy levels. This also explained how the spectra of gases had distinct, thin, spectral lines. I've illustrated this with the Balmer series - because it is composed of lines which are visible to the eye (H-alpha is red and caused by a jump from the 3rd to 2nd orbit; H-beta is cyan and caused by a jump from the 4th to 2nd orbit; H-gamma is indigo and caused by a jump from the 5th to 2nd orbit; and H-delta is violet and caused by a jump from the 6th to 2nd orbit). I've shown both the quantum jumps (squiggly arrows - squiggly lines are tradition for photons) and by the line spectrum below Bohr. Confession: In the first edition, the model of the atom was behind him. It turns out that if your four year old beloved son/tyrant wakes you in the middle of the night and keeps you up for some time, you probably aren't with it enought to try and print a 6 colour linocut with a tricky registration. I didn't change this print based on an aesthetic decision. I simply messed up the layout but decided to run with it. I decided I like it this way.